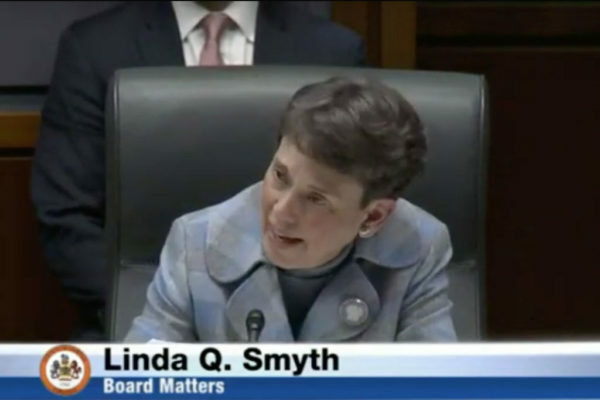 Fairfax Supervisor Linda Smyth, whose Providence district includes Tysons, announced at a Board of Supervisors meeting earlier today (Tuesday) that she will not be running for reelection. At the meeting, Smyth said she will be retiring next year. Fellow local officials were quick to share their thanks and congratulations to Smyth. Smyth was elected in 2003, then reelected in 2007 and 2011. Smyth’s district includes Tysons and Merrifield, both of which have seen substantial development since she was first elected. Smyth’s announcement is part of a shakeup on the Board of Supervisors. Supervisor John Cook (R) from the Braddock District announced that he would not be running for election again. The Washington Post reports that Board of Supervisors Chairwoman Sharon Bulova (D) and Hunter Mill’s Supervisor Catherine Hudgins (D) are also deciding whether or not to run again. The Hunter Mill district includes Vienna and Reston.